After Measure S – What is Next for LA? 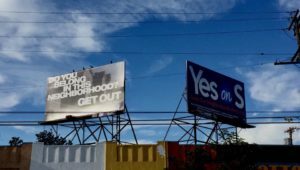 LA voters sent a clear message on March 7th by voting down the NIMBY, anti-housing Measure S in an epic landslide, 71% to 29%. That’s created a huge amount of momentum for pro-housing advocates like us, as well as given our elected leaders a boost of political capital to use for pro-housing policies. So what’s next for LA? Plus, we’ll host happy hour, as always. We’ll provide some apps and drinks, but please bring drinks if you’d like to share or if you’ve got a favorite. Mercado la Paloma is a former warehouse which hosts a bunch of great restaurants, plus our group meeting space. It’s just south of downtown and near two Expo line stops. To get to the community room, go the back-left corner of the building after you enter (South-East corner). 4. Our short-term solution is to advocate for developments which will provide more housing, and our long-term solution is to advocate for legislative changes which will enable and encourage more housing to be built.